We begin with the book that taught us that Germans are people, too! Young Patty learns about the world in her small town. If you or anyone you know is a victim of domestic abuse, please do not be afraid to reach out. You are not alone and please know that someone loves you and wants you to be okay. Reach out at https://www.childhelp.org/hotline/ or call The Childhelp National Child Abuse Hotline 1-800-4-A-CHILD (1-800-422-4453) or at your local school, shelter, or safe place. 1990 - Connecticut - Challeged in curriculum at Burlington and Hawinton schools for profanity and "subject matter that set bad examples and gives students negative views of life." 1996 - New Jersey - Temporarily removed from 8th grade supplemental reading list in Cinnaminson for "offiensive racial stereotypes." 2002 - Challenged for racism, offensive language, and being sexually explicit. Greene, Bette. Summer of My German Soldier. Bantam Starfire. 1983. 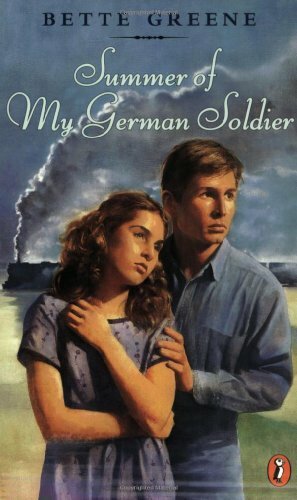 Own the September 2017 book of the Banned Library Podcast, Summer of My German Soldier. Has all the notes and random musings and stains from the library. "The summer that Patty Bergen turns twelve is a summer that will ahunt her forever. When her small hometown in Arkansas becomes the site of a camp housing German Prisoners during World War II, Patty learns what it means to open her heart. Even though she's Jewish, she begins to see a prison escapee, Anton, not as a Nazi, but as a lonely, frightened young man with feelings not unlike her own."